Activists associated with the IIRON Student Network and GSU protested the budget cuts outside a May 31 staff meeting. On May 25, the University told employees in several humanities departments that a wave of end-of-the year layoffs would take effect at the end of June. The firings have provoked negative responses from members of the affected departments and incited protests by members of various campus and faculty organizations. According to sources in the Humanities Division who asked not to be named for fear of reprisal from the University, department secretaries for the Departments of Slavic Languages, South Asian Languages and Cultures (SALC), Germanic Languages, and Linguistics were told by the office of the Dean of the Humanities that they would be losing their jobs as of June 30. The same sources said that the secretary for the Department of Comparative Literature was apparently exempted because she had already announced that she would retire at the end of the year. Some of the secretaries will be hired back, but will be expected to perform their duties for two departments rather than one. Currently, secretaries are responsible for room bookings and travel reimbursement, arranging parties for students defending their dissertations, and fostering connections between students and faculty. University spokesperson Jeremy Manier declined to comment on the specific administrative layoffs. Various sources have also alluded to additional unpublicized cuts, particularly in the linguistics and art history departments as well as the Divinity School. The specific extent of the layoffs is unclear, and members of the affected departments have been critical of the lack of communication by the University administration. Members of the affected departments have largely attributed the cuts to the University’s proposed Shared Services program, an initiative led by Vice President for Operations and Chief Financial Officer Rowan Miranda. Miranda oversaw the implementation of a similar program as associate vice president for finance at the University of Michigan, where faculty also expressed opposition to the involved cuts. In an early April interview with UChicago News, Miranda said that the Shared Services program will involve communicating with members of individual academic departments to determine what basic activities, such as computer support services, could be shared between units. “Shared Services involves consolidating routine functions into a new team solely focused on improving service satisfaction and reducing cost,” Miranda said. University officials have stated that this particular round of cuts is not directly related to the Shared Services program, which will be officially implemented by early 2017. Instead, they said, the current cuts are related to an 8 percent budget cut being imposed on academic departments. The cuts last year, by comparison, were 2 percent, according to Crain’s Chicago Business. “Shared Services is still in an early design phase and is not driving these reductions, which are a result of units meeting annual budget targets,” Manier wrote in an e-mail. However, members of the affected departments expressed concern that the layoffs are at least a foreshadowing of the coming transition to a shared-services model. About 30 activists associated with the IIRON Student Network, a coalition of campus activist groups, and Graduate Students United (GSU) gathered at 9 a.m. on May 31 outside a staff meeting to protest budget cuts, layoffs, and Shared Services. Soon after the beginning of the meeting, the protesters ran through a series of chants, including “Robert J. Zimmer, budget trimmer.” As the protesters reached the end of their planned chants, a woman exited the meeting room and said the staff inside could not hear the dean presenting to them. 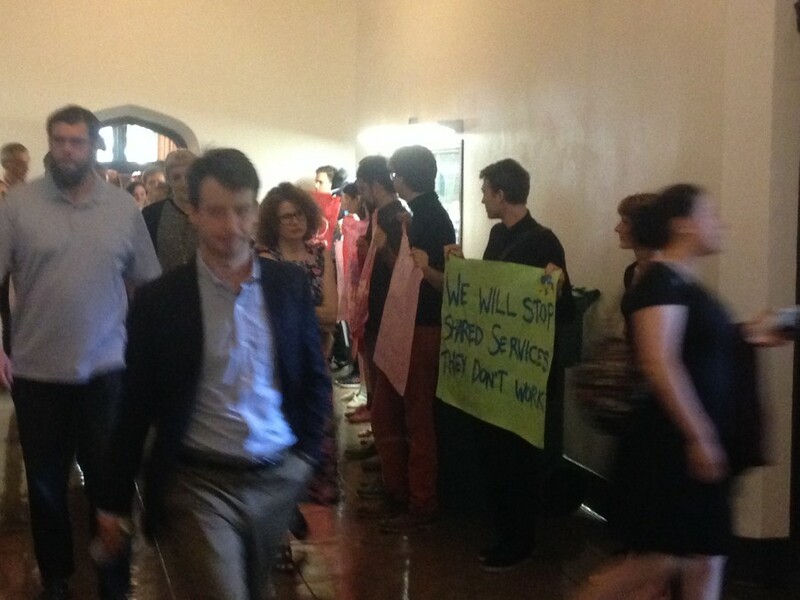 Activists lined both sides of the hallway leading to the meeting room, so that attendees of the meeting walked past them when they entered the meeting and when they exited about an hour later. Though some of the exiting attendees did not acknowledge the protesters, a few expressed their support as they walked by, and one attendee hugged and thanked a protester. After the protest, graduating fourth-year Spencer McAvoy, one of the event’s organizers, rejected the idea that the University was forced to make cuts due to budget constraints, citing University funds used for new construction and management of the University’s endowment. On Saturday, IIRON and GSU members also protested the cuts outside the Arts Incubator in Washington Park. The University recently announced further development of the Washington Park Arts Block, a corridor of arts and culture–related facilities along East Garfield Boulevard. Protesters also picketed outside Alumni Weekend events on Saturday. Various other organizations have voiced opposition to the cuts and the implementation of Shared Services in general. GSU posted a petition on June 3 asking the University to halt all layoffs and Shared Services–related transitions pending further communication with members of the community. The petition had been signed by 445 people as of Monday. Faculty Forward UChicago, a subset of Service Employees International Union (SEIU) representing some non–tenure track faculty, released a statement calling the layoffs “short-sighted” and urging the administration to find alternative ways to trim the budget. According to Willemien Otten, chapter president of the UChicago branch of the American Association of University Professors (AAUP), the organization is concerned about the University’s lack of communication and is working with GSU and other organizations to address the issue. “To the extent that these cuts forebode the Shared Services approach, which does not seem a step favorable to faculty culture and threatens to further erase institutional memory on the departmental level, often stored in years of loyal service by staff members now cut, the AAUP is very concerned about the cuts themselves as well as about the larger direction that they indicate,” Otten wrote in an e-mail. According to union representative Catharine Schutzius, at least five of the university employees affected by the layoffs, and many that may be at future risk, were members of Chicago’s Teamsters Local 743. Schutzius said that in addition to working with campus organizations to respond to the layoffs, the union is investigating to determine whether any discrimination or contract violations occurred and will take necessary legal action if anything is found. A Change.org petition with 566 signatures as of the writing of this article was created on June 1 to oppose the firing of SALC Department Secretary Alicia Czaplewski, a 22-year employee of the University whom the petition referred to as a “foster mother” for members of the department. After the changes, SALC will share the position with the Department of Slavic Languages, and the Germanic languages and comparative literature departments will have to share a coordinator as well. Rowan Miranda will leave his position by the end of the month.